Washington D.C., USA. November 12 - 16, 2016. 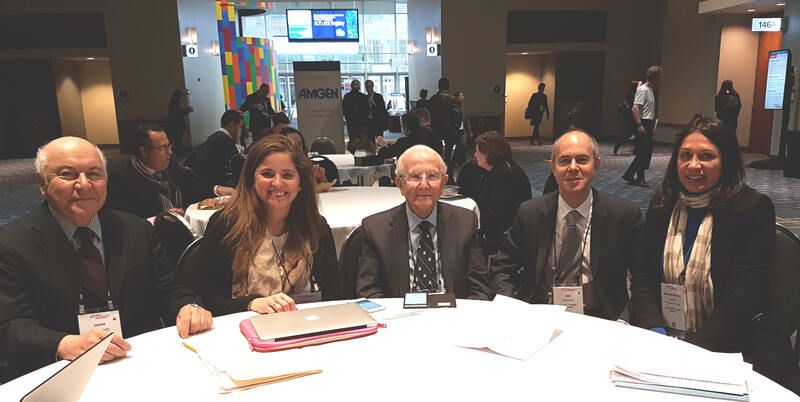 Prof. Bravo participated in the ACRs 2016 Annual Meeting held in Washington D.C. Once again the Joint Hypermobility Study Group came together, and Dr. Bravo, alongside Dr. Gall, were co-convenors. In this opportunity, he presented his study about an "Easy way to Suspect Ehlers-Danlos type III, with Slides". Also, Dr. Neuseli Limari told us about her more than 20 years experience with hypermobility patients in Brazil. Representing her father, our friend Antonio Bulbena, Andrea Bulbena, Psychiatrist, talked about Anxiety in Ehlers-Danlos. This time, Prof. Bravo also presented a poster with 2300 Ehlers-Danlos patients, and spoke about the high frequency of Osteoporosis and Dysautonomia amongst these patients, always putting special emphasis on the high incidence of Ehlers-Danlos with little or no hipermobility (51%) which makes its diagnosis even more difficult.